How To Train Like A Lady With Phil Learney! For the first time in my time as a trainer I have a larger dominance of male over female clients. There are many reasons am sure for this but one of the major ones is that men (I know I am one) generally hate taking advice about training. There seems to be the acceptance that as a male you are born with this knowledge alongside the ability to fix broken cars. So I can say that I have done maybe 60% of all of my sessions with women so that would equate to about 7,800 hours I’ve spent training women. After studying Sport and Exercise Science there was something that didn’t quite make sense to me in the way that women traditionally or where told to train. I’ve never been one to ‘fit’ into what other people do or what was ‘trendy’ or cool so I changed my approach straight away. Now eighteen years later I stick to a slightly modified and more advanced method yet fundamentally the application is the same. Does it work? Well you can ask my clients quite happily. I don’t like to ‘prove’ and to be honest once my new website is up it’s the first time I will have used pictures and/or testimonials from clients. Anyone can manipulate figures or pictures as I so often see. Our industry is also riddled with con merchants as people who are desperate will believe almost anything! 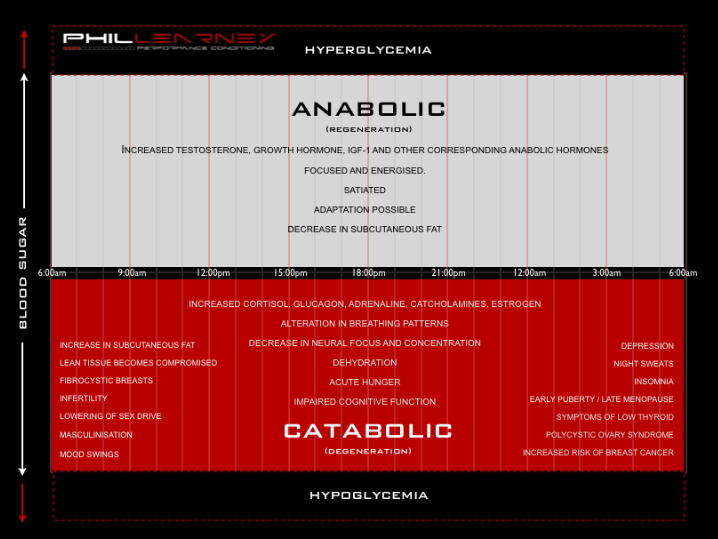 You’ll have heard me just recently talk about the differential in hormonal status between men and women and the fact women not only lack an excess of the anabolic (regenerative) hormones to build large amounts of muscle tissue but also they have an excess of catabolic (degenerative) hormones that permits for more muscle loss and a larger amount of fat gain. Before we start to get to the nitty gritty it must be understood that the media depiction of what a female looks like after lifting weights is largely misleading and WRONG! If hypothetically a female was to increase the amount of anabolic/androgenic hormones using alterior methods there will a larger ability to turn over excess muscle and also the corresponding level of masculinisation would occur……that is ONLY IF! The natural levels of a female dont allow for this apart from in extreme case where the hormonal make-up of a female is disrupted for whatever reason. If we MAX them out all that happens is a corresponding drop in bodyfat and increase in regenerative hormones……..a whole myriad of other things if you refer to my article about Insulin. Priority 1. Increase Anabolic Hormones and minimise Catabolic hormones. Bodybuilding is the practice of strengthening and enlarging the muscles of the body through exercise. The greatest method we have for this is to use what is called Sarcoplasmic Hypertrophy. Sarcoplasmic Hypertrophy is the pumping of blood and sarcoplasmic fluid into the muscle until it swells and tears. This is adapted to, assuming nutrition is adequate by the enlargement of the cross sectional area of the tissue. This means we get bigger! How big again dependant upon hormonal make-up and a whole load of other factors. The most effective way to do this is to lift slow, light and high repetitions. The negative to this is it will only use the amount of muscle the body see’s fit to recruit. Muscle ‘TONE’ or ‘TONUS’ will therefore only be evident once the blood is pumped back into the muscle. A soft physique will be pretty evident therefore cosmetically will only offer a change once the muscle is suitably large enough to see. Think of it as a compartmentalised balloon that has only had one section blown up. Mistake 1. Using lighter weights and higher reps pumps blood but creates a lack of tone to the muscle. This recruitment is dependant upon 2 factors if we want to recruit more of the muscle to create the much needed TONE and hardness to muscle without the accompanying size. Only under stress will the body recruit more motor units and utilise more of what is already there. Therefore the two parameters that need manipulated in the weight room are MASS and SPEED. Lift HEAVY weights and lift weights FAST lowering them under control. To begin with the focus should be on the speed for a beginner and as technique improves gradual addition of load. Volume should be controlled to short sets and low reps to minimise risk of muscular growth. Due to the elevated levels of Estrogen a female has, Osteoporosis is a major issue. Creating load on bones will release much needed calcium and keep bone health in check. Tip: Remember that as you unrack a weight it WILL feel heavy as its your smaller muscles in the arm and your grip that bares the weight initially. Cardiovascular training will increase Cortisol (A Catabolic Hormone) and inflammatory levels (This causes premature aging and cellular damage). High cortisol will switch on the survival mechanism that stores FAT. As a female has a higher tendancy for fat storage as it is CV is OUT as far as I’m concerned. I do NO cardiovascular exercise with ANY of my female compositional clients. Mistake 2. Doing Cardiovascular Exercise. There is an acceptance in gyms that free weights should be avoided as it will create bulk. These will create more strength and neuromuscular function than anything else. Machines where designed and invented for bodybuilding and function perfectly for those slow, controlled and targeted high reps. Trying to target fat deposition sites seems to again be something that people remain to do again and again. Women doing countless reps on hip adduction and abduction machines. Guess what happens if you isolate and pump a muscle full of blood? The issue is bodyfat and that is a diet thing NOT a training thing. It is also a hormonal thing as deposition increases around the hips and thighs as all the body wants to do either under a) Starvation (restrictive diets) or b) Excessive stress elevation (Cardio and lifestyle) is protect the reproductive system. NB: Women and Men can both have cellulite, the difference being that females have thinner connective tissue around the hips and thighs to allow for childbirth. This is why the cellulite becomes visible. An organised and managed hormonal state will allow connective tissue to remain strong and mask cellulite. Priority 3. Stick to big multiple joint movements. Single joint movements are reserved in the most cases for bodybuilding and rehab. More is NOT always better. Spending excessive amounts of time in the gym is not a good approach for anyone but more-so a female. Again this elevates stress hormones and induces the likelihood of an uncontrolled catabolic (fat gain, muscle loss, insulin instability etc) state. For a female the main body of a workout I would restrict to about 35-45minutes of VERY intense work. Think of the muscle tone on a sprinter as opposed to a marathon runner. Priority 4. Keep your workouts SHORT and sharp! There also seems to be a LARGE fear for the use of supplements in particular protein in women. Protein DOES NOT make you big it is the foundation for ALL cellular repair. It repairs hair, nails, skin, bone and even muscle. Amino Acids are a posh name essentially for protein. The cosmetic industry know you’re deficient thats why products are riddled with amino acids and essential fats. Low fat, Low protein Low calorie diets that have the small amount of calories in them coming from carbs? NB: Collagen, the stuff that keeps your skin tight, wrinkle free and also holds your body together is a protein. It has a large amount of proline and lysine in them which are found primarily in animal foods. Ask yourself this: Is what I’m doing at the moment working? IF you WANT to continue doing what you do DO NOT expect anything different. The training and approach between a male and female isn’t as different as it may seem. There are subtle changes but for the most part the gym is a full on UNISEX environment if everyone is looking to be toned, bigger OR stronger as their main goal. Also there are no such things as male and female foods. You DONT have to eat yoghurt and granola for breakfast anymore! !